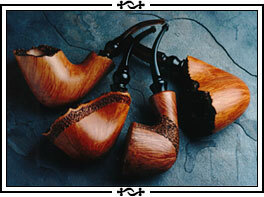 All my pipes are guaranteed for a period of six months from date of purchase. This covers all hidden defects in wood and stem materials. Please note that defects caused by improper pipe use, including breaking of the stem, burning holes in the bowls by smoking your pipe too hot or by rough treatment are not covered by this guarantee. In the case you are not completely satisfied with my pipe upon receiving it, you may return it to me for full credit providing you do so within 14 days of receiving it and the pipe is returned un-smoked and in it's original packaging and condition.